I started out with a Calvin and Hobbes cartoon depicting how many people see business today… run by narcissists, producing little of real value and looking to be subsidized. Dr. Richard Liroff, Executive Director of the Investor Environmental Health Network (IEHN), was one of the participants at our table talk. It was nice to learn of our shared respect for Louis D. Brandeis (Brandeis on Democracy ). Shareholders have an obligation to ensure their businesses operate consistent with public welfare. Of course we are all well aware of the symptoms of poor corporate governance, such as global warming and the erosion of the middle class in America. We like to think of ourselves as the richest country in the world… and we are fairly high up with regard to average or median wealth. However, that’s primarily because we have quite a few billionaires who skew the average. Take a look at median net wealth – half above and half below. By that measure we are nearly as rich as Slovenia. Most Canadian have twice our wealth, while Australians have close to five times our wealth. We all know that corporations have enormous power. So much power in fact that we can’t depend on government alone to reign in their excesses. We need to restructure our corporations so they are more democratic. Let’s make corporate ‘elections’ more meaningful than those in North Korea, where one party rules. Yes, they/we can vote… but without real choice. Most funds are incentivized not to monitor. See my post on Agency Capitalism. 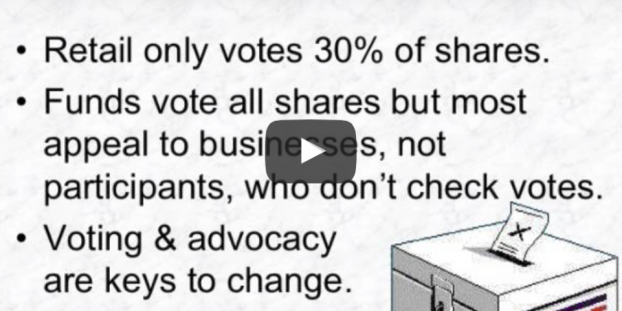 Directors, our elected representatives, aren’t working for shareholders as whole people. Fiduciary duty shouldn’t mean maximizing short-term value at the expense of a salubrious environment. Give Deferred Compensation Plans More SRI Options. Such funds invest for the whole person, not for a disembodied image of the ‘rationally’ selfish individual. Announce Proxy Votes Before Annual Meetings. 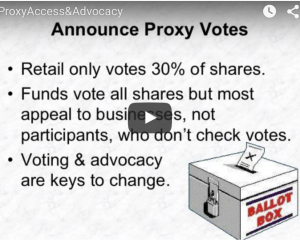 Most retail shareholders don’t vote because they don’t know the nominees or the issues. If your funds announce votes in advance, those decisions can be picked up by others, such a ProxyDemocracy.org, and you will influence those who can’t or won’t invest the time and resources to sort through the candidates and proposals. 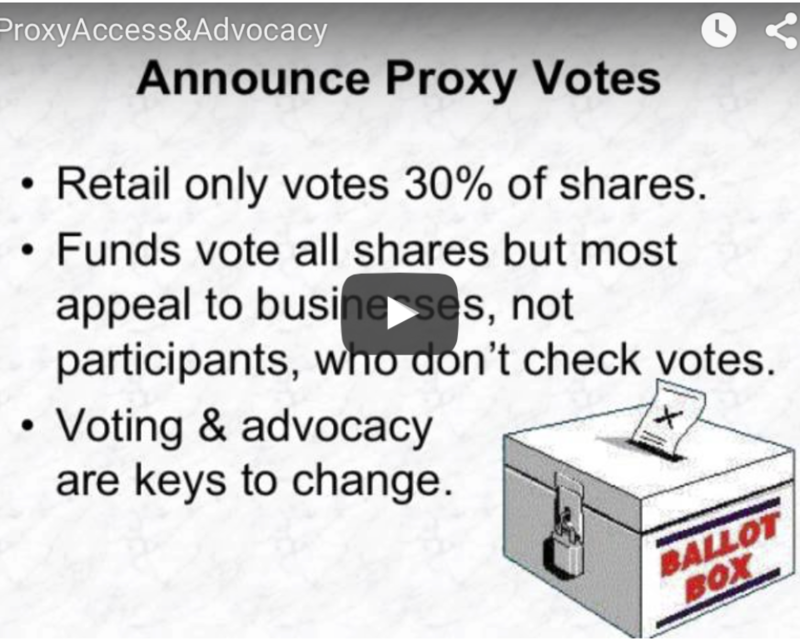 File Shareholder proposals, especially for proxy access. If we can nominate and elect the right directors, they can actually represent us as whole people. We don’t need “independent directors,” we need directors who are dependent on and accountable to shareowners and to the greater society. Democracy requires accountability. You get it: The notion of “sustainability,” while vitally necessary, inspires enthusiasm like a hairshirt. What we humans really want to do is thrive! The problem sustainability confronts is that the human pursuit of thriving (as currently enacted) wreaks havoc — we overshoot planetary boundaries and erode social foundations. We need to redial our economy so that we can thrive in a sustainable manner, within the ecological system’s carrying capacity.